‘A Modern Bestiary (While Darwin Sleeps…)’ is the latest group show to be presented at the NGCA in Sunderland. It may be said that group shows have a tendency to be ill conceived, badly presented and contain generally irrelevant theoretical explanations. However, I was pleasantly surprised by ‘A Modern Bestiary’; it is an extremely coherent exhibition, both aesthetically and ideologically. A ‘bestiary’, which serves as the impetus for the exhibition, is “a medieval illuminated manuscript describing both real and imaginary animals”. Each of the eight artists here has created work that explores the human endeavour to understand nature. The show has been expertly curated, managing to juxtapose an exploration of the type of fictional animals that could be found in a bestiary with a questioning of the scientific processes of ordering that seek to give an explanation of true nature with ease and intelligence. Although each of the artists are presented in separate spaces, the flow of the exhibition remains open, with soundtracks being allowed to overspill and intertwine. Perhaps unexpectedly, the effect that is produced does not restrict or confuse the reading of the work. Rather, while one traverses through the different rooms, the varying combinations of background noise amplify a sense of uneasiness, or underlying darkness that permeates this whole exhibition. 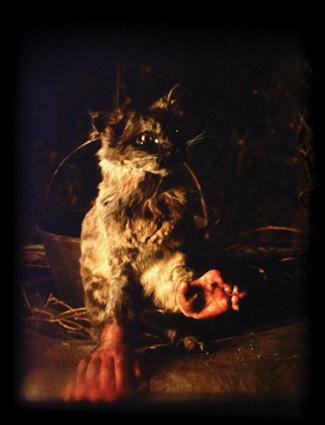 This macabre theatricality is expressed most powerfully in the short film, ‘The Cat With Hands’, by Robert Morgan. Using techniques that include both live action and stop-frame animation, Morgan suspends disbelief and convinces the viewer of the other-worldly vision that he is presenting. The process of combining the domestic animal with the human, both of which are encountered in everyday life is not, in itself, a disturbing act. Rather, it is the way in which Morgan adopts a gothic, dreamlike aesthetic drawn from the darkest reaches of history that leaves us with a sense of terror. ‘The Cat With Hands’, throws a shadow across the whole of the exhibition, allowing a more accessible insight into the uneasiness that is present in even the most comical of work shown here. If the films on display in ‘A Modern Bestiary’ can be seen as the records, or catalogues of classification, then the sculptural responses can be read as the creatures that exist in this museum of the absurd. Ebony Andrews displays a series of hybrids composed of real animals and consumer objects. Grafted together in an absurd and functionless manner, we are left thinking that the animals which inhabit Andrew’s world may have developed the need for consumerism. Or perhaps, our human obsession for the accumulation of artificial objects may have reached such a level that we are unable to distinguish between the natural and the manufactured. Throughout this exhibition we are forced to question our human necessity for the categorisation of the natural world however illogical the results may be. What we are witnessing here is a playful exploration of Foucauldian genealogy. The process of classification expressed in conventional western thought, in this sense, can be seen as being a pseudo-scientific method of understanding the unknown that is ultimately fictional, or as Michel Foucault stated in ‘The Order of Things’, “The quality of monstrosity here does not affect any real body, nor does it produce modifications of any kind in the bestiary of the imagination”. I am a freelance art critic & theorist based in the North East of England. I am specifically interested in artistic practice involving new media, site specific and performative aspects.